Are Patients That Undergo Bariatric Surgery At a Greater Risk for Gastro-Jejunal Anastomotic Complication Compared to Those Undergoing Non-Bariatric Foregut Surgery? Background: Gastrojejunal leak is a dreaded complication following foregut surgery. The present study evaluates the incidence and risk factors for the development of anastomotic complications for bariatric and non-bariatric foregut operations. 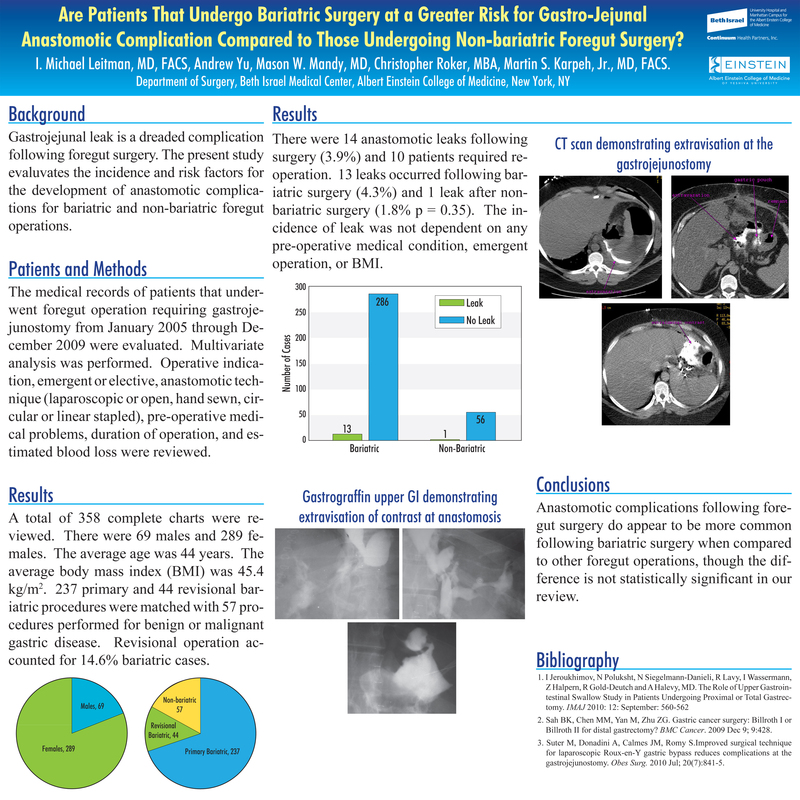 Patients and Methods: The medical records of patients that underwent foregut operation requiring gastrojejunostomy from January 2005 through December 2009 were evaluated. Multivariate analysis was performed. Operative indication, emergent or elective, anastomotic technique (laparoscopic or open, hand sewn, circular or linear stapled), pre-operative medical problems, duration of operation, estimated blood loss, were reviewed. Results: A total of 358 complete charts were reviewed. There were 69 males and 289 females. The average age was 44 years. The average body mass index (BMI) was 45.4 kg/m². 237 primary and 44 revisional bariatric procedures were matched with 57 procedures performed for benign or malignant gastric disease. Revisional operation accounted for 14.6% bariatric cases. There were 14 anastomotic leaks following surgery (3.9%) and 10 patients required re-operation. 13 leaks occurred following bariatric surgery (4.3%) and 1 leak after non-bariatric surgery (1.8% p = 0.35). The incidence of leak was not dependent on any pre-operative medical condition, emergent operation, or BMI. Conclusions: Anastomotic complications following foregut surgery do appear to be more common following bariatric surgery when compared to other foregut operations, though the difference is not statistically significant in our review.